I’ve always been fascinated by origami. I mean, you can take a piece of paper – ANY piece of paper – and turn it into a three-dimensional creature solely by folding that piece of paper. How awesome is that? Who came up with that idea? “Gosh, I’m bored and all I have is this piece of paper. I know, I’ll fold it until it looks like a bird.” Really? My origami dragon. Of COURSE I can make a dragon. The most complicated origami I can do. Still amateur level, trust me. 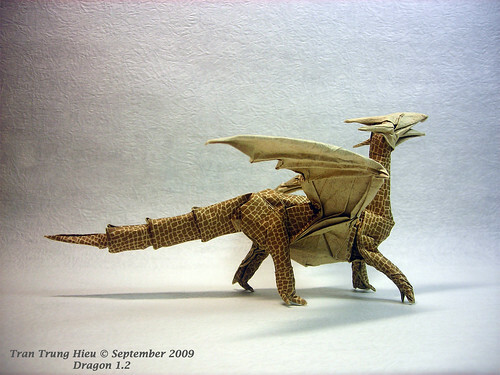 Now, I don’t know if this guy follows the “rules” of traditional origami (no cutting, gluing, etc, just folding), but who cares? This is awesome. And I will never be able to create anything close to these even WITH cutting, gluing, etc. Dinosaurs, skeletons, insects (centipedes! ), angels, he does it all. Want to see? Check out his Flickr. So readers, have you ever tried origami? Do you just make cranes? (Love cranes. Especially the ones with flapping wings.) 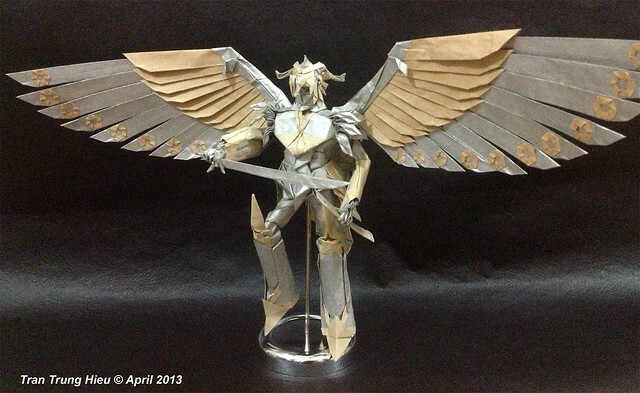 Or are you an origami god like this guy? Or would you rather see the fruits of others’ paper-folding labors? Comment!